Thomas was born in Port Chalmers on 22 March 1893, the only son of George and Louisa Alice (nee Burns) Driver. He was educated at the George Street, Port Chalmers and Sawyers Bay Schools, Dunedin. At Masterton, on 21 August 1914, Thomas enlisted for war service with the Wellington Infantry Battalion, 17th Ruahines Coy. He gave his current address as Dannevirke, and his occupation as Labourer. Described as being Anglican, single, aged 21, 5 foot 8 inches tall, weighing 140 lbs, chest measuring 33 inches, of dark complexion, grey eyes, dark hair and teeth having no decay. He nominated his father, Mr George Driver of Fairlie, later of 28 Elizabeth Street, Timaru, as his next of kin. He also stated that he had had 2 years 7 months previous military experience with the Port Chalmers Naval Unit. Thomas left Wellington with the Main Body on 16 October 1914, aboard the SS Arawa, bound for Suez, Egypt. On 6 May 1915, he joined his unit on the Dardanelles and was reported missing in action on 8 August. A Court of Enquiry held at Moascar Camp, Ismalia, on 24 January 1916, found that he was “Now believed to be dead at the Dardanelles, 8 August 1915”. There being no body found to be buried, he is commemorated in the Chunuk Bair Cemetery on the NZ Memorial, Panel 20. 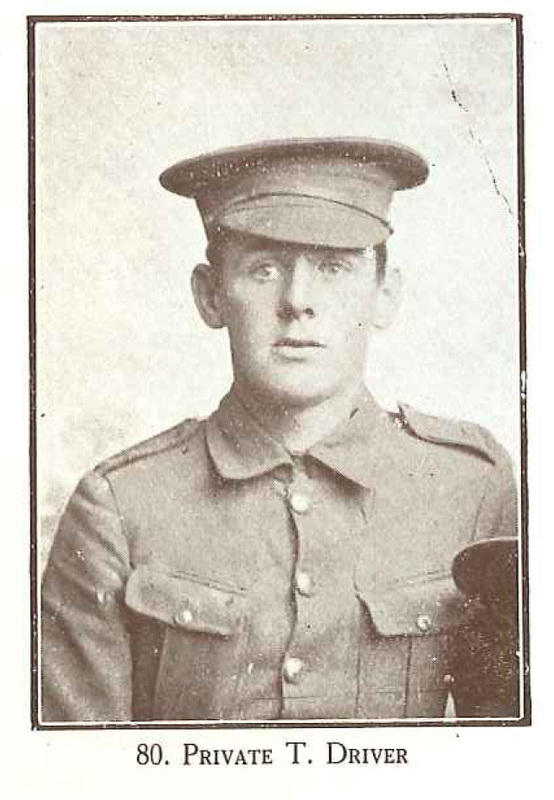 Thomas's father, in Timaru, was forwarded his war medals: the 1914-1915 Star, British War Medal and Victory Medal, along with a plaque and scroll, shortly after the war ended.